1- Beware of internalizing what you read. Blogging often requires us to read other bloggers’ content. It’s in my nature to want to understand and identify with the people I associate with. This can be a dangerous approach to blogging. First and foremost, you may end up overidentifying and rationalizing a piece that has nothing to do with your life. Secondly, it can impact your sense of self-worth and identity. I’ve walked away from critical articles about moms, bloggers, and homeschoolers and never realized just how much the words impacted me. If it’s harsh or negative, I quite often take it to heart. I wonder, is that me? Do I do that? Am I a bad mom, a bad blogger, a bad Christian, a bad homeschooler? Just because someone wrote something that resonated with you, or emotionally affected you does not mean it has to be your truth. The only piece of literature I wish to internalize is the Bible because it’s God’s truth. Other writings can be eye-opening and thought-provoking, but I know now that nothing should take the emotional place of God’s word. 2- Don’t overwhelm yourself with what you “should” do. Everyone has an opinion, but when it comes to blogging, the advice is unending. Be warned, the excessive knowledge can sink you. I’ve attended many webinars, taken numerous blogging courses, and bought many blogging books. This information overload can be a burden. It puts you in a place of frequently needing to change, fix, or improve something. This constant state of improvement robs us of the time we would rather spend writing and enjoying our lives. I also realized that following someone else’s formula for success won’t work for me. In fact, this past month I reviewed the top posts on my blog and was stunned to discover that the posts with the highest traffic were written before 2014. I found this fascinating considering that 2014 was when I decided to get serious about blogging and tried to make a profession of it. I know about SEO, how to build beautiful, clickable images for Pinterest, and I have an active blogging community, but my content after 2014 has not had the same impact on my blog as the content before this. What happened? I have a theory… see my next point. 3- Be careful when switching objectives. I heard and read countless times that to find success in blogging, you have to narrow your niche. I did this. In fact, I started my other blog, Deliberate Homeschooling, to narrow The Deliberate Mom into the parenting niche. Even though it’s only a few months old, Deliberate Homeschooling has been growing more than I expected. One could argue that its specific niche is why it’s doing well but I think the reason for this is entirely different. I think it’s because I’m passionate about homeschooling. Am I passionate about parenting? Yes and no. It’s my goal to be the best mom I can be to my children but it’s such hard, exhausting, and overwhelming work, I couldn’t honestly say it’s my passion. My passion resides in being deliberate and reflective in how I raise my children. The countless screw ups, the bad days, the frustrations… those aren’t my passion. I have other passions too. I like to experiment in the kitchen. I like to sew and paint. I like to organize my home. I like to set up impressive play spaces for my kids. I’m crazy about office supplies, colored gel pens, binders, and Excel spreadsheets. By narrowing my niche, I’ve been saying no to a lot of content that I wanted to share here on The Deliberate Mom. As a result, I’ve been stifled, uninspired, and lacking passion. 4- You can’t please everyone. I recently spent some time thinking about who would read and enjoy my blog. As I envisioned that person, I realized that I’ve been trying too hard to please too many people at the same time. How can I be passionate if I’m safely sharing what I hope will make everyone happy? To add to that, if someone were unhappy and unsubscribed from my newsletter or Facebook page, I would wrestle with feelings of rejection. The constant feelings of rejection certainly isn’t a healthy way to live. The realization that I can’t please everyone will take me some time to fully grasp, but I feel it’s incredibly important for me to embrace this truth if I want to continue blogging. 5- Stick to YOUR truth. I’ve read it countless times. I’ve written about it repeatedly. I fell into the trap of comparison. I found myself looking at other bloggers and wondering why they have succeeded, and I haven’t? Why are they reporting these huge incomes, yet I have to work countless hours just to cover the costs of running my blog? I found myself looking at their niche, their pictures, and their social media accounts. When I did this, all I saw was my lack. It’s taken me a few weeks to get out of the rut of comparison. I found that my biggest place of insecurity was Instagram. It felt like everyone’s pictures were far more beautiful and interesting than mine. But here’s the kicker friends… I only wanted Instagram to be a behind-the-scenes glimpse into our lives. So why then, was I feeling insecure? Perhaps it was because the true, the gritty, the unfiltered lens of our lives isn’t perfect. For someone who’s always trying to achieve the highest standards, that imperfection is unsettling. When I found myself pinning articles about how to grow my Instagram account and researching hashtags, I knew that my vision had gone awry. I had to reset my intentions and remind myself that my Instagram account is entirely separate from my blog. I intend on keeping it that way. 6- Accept that it’s a journey. Every time I post something new on my websites, something shifts. I learn, I expand, I grow, I move through challenges, I overcome obstacles, and I celebrate. My journey right now has brought me to a place where I no longer want to blog for profit. I just want to share what gives me joy and what I’m passionate about. It may be a recipe or a reflection inspired by a book or a special moment from our days. I want to be as real as possible. I want you to read my content because you expect you’ll get something from it. I want you to come here and be met with love, sincerity, and truth. I’m not going to write because of schedules, timelines, and pressures to publish “x number of times a week.” I’m going to write whenever I want. So friends, what have I learned from this break? From now on I will write about what I love, what makes me happy, and what inspires me… when it inspires me. Yes! I 100% agree with all of this! I occasionally write posts on blogging tips, and they always do very well. Then I think.. should I write more of these? But I always remind myself that those posts are NOT why I started my blog and it is not what I want it to be about. I enjoy sharing tips and tricks when I feel like it, but I refuse to simply follow the pageviews. This was a great read and I am glad you found clarity! I just want to write about what I love and I want to write when I feel like writing… not because I “should” be posting at particular times. I’m throwing all rules out the window and does it ever feel good!! So glad you enjoyed this Lauren – and thank you for sharing your thoughts on blogging. Thank you Kendall. I’m happy to have put blogging into proper perspective in my life and enthused to share what I want… when I want! Oh Jennifer this was such a breath of fresh air! You know that I have also been struggling in many of the same areas;) Now that I have come to many of the same conclusions it’s so freeing and blogging is so much more enjoyable. Why put so much time into something if it’s only stressing you out and giving you grief!? I believe if we continue to be faithful with what God calls us to do we will find joy and true contentment and he will bless it. Joining you on this journey of discovering more about ourselves and our calling! Thank you so much Rebekah! I’ve been pushing, praying and searching so hard for the past few weeks and I feel totally relieved and at peace with my decision to stop blogging for profit. I’m excited to take my blog back to the place where I write and share what I feel like sharing. I’m breaking all of the blogging “rules” and it feels good! Thank you so much Janine! I’m happy to be back and I’m glad my break gave me this new (and much needed) perspective. You already know how I feel on this topic – I totally agree with you. That’s really fascinating that your content from before 2014 has the most traffic; it’s as if readers are truly drawn to the content we’re passionate and authentic with. My highest ranking posts are all the ones I started writing after my little epiphany. The posts I thought wouldn’t do well but they are because they’re authentic and I’m passionate about writing them. I’m so over all of the “rules” of the blogging/entrepreneur world. I’m only considering the rules that feel good to me, otherwise I’m tossing them out! I’m so glad I took this time to collect my thoughts Jessica. I too, am completely done with all of the blogging “rules”. I find them burdensome and I’m only doing what I want to do – not what others “say” I should do. How liberating! Wow, this is indeed a very candid look at blogging. You have had a lot on your mind and in your heart for sure.I wrote a similar post like this on Monday and I am a big believer in “doing what works for you”. Who cares what everyone thinks. Now for a little Jen “candid-ness”. I have a terrible secret about blogging; I don’t purchase any of the products that are supposed to make your blogging life easier. Never have. I kind of think it’s a racket and truthfully I am happy doing what I do. Sure, my audience may be small, but it is full of good friends and that is all that matters. Okay, so I just read the post you referenced… awesome stuff Jen. Yes, I’ve had a lot on my heart and mind. This past month has been an eye-opener for me. I feel refreshed to have taken this new perspective and I’m breaking all the blogging rules from now on. Why not?! Thanks for sharing Jen – I’m with you on this. A few weeks ago a blog title caught my attention “If you want progress stop learning and start doing”. I never actually read the blog – but the title has become my constant voice in my head – making me stop subscribing and signing up for more information! I too have been struck by the phrase “blogging for profit” and started to see that most of the blogging help has that goal – and that isn’t my goal. Sure, I want to do the best I can, but with a different goal, which affects my attitude and effort. So thanks for putting more thoughts into words for me! “If you want progress stop learning and start doing” — wow, I love that! I have felt so burdened by the information overload! It’s been way too much learning of everything. I’m tired and worn out from all of the reading, advice, webinars, and classes. Thanks for sharing your thoughts on this Belinda. It sounds like we’re having similar revelations! Amen Amen! I have a very similar post in my draft folders right now. You just said it so much better than I have. I am so thankful that you have recognized all of these truths. You are so gifted in the area of blogging and I hope you continue to pursue it, which of course no pressure from me! This has been on my heart and has brewed over the past month during my break. I am so happy to be in this place of contentment… free of boundaries and rules as set out by “big and successful” bloggers. The joy is back – thank the Lord! I appreciate your kind words my friend. Thank you! So good- these are such important reminders for bloggersI It is so easy to get overwhelmed with it all and get consumed with all the should do things and forget why you are doing what you do. Thank you for this! Blogging can be so overwhelming — especially when you’re listening to the voices of hundreds of experts! I’m so glad I’ve had this epiphany and that my joy for blogging has returned. My purpose is clear… and that’s important! I loved this post Jennifer! The reason I never chose a niche is because I enjoy writing about so many things; I’m not a one trick pony, haha! I’m so glad you took the month off to figure all these things out. I’m so happy for you and can’t wait to read more of what you really want to write. I’m delighted you enjoyed this post Tiffany! It’s funny, I resisted the whole niche thing until the end of last year. I know now that it wasn’t the best idea to narrow in on the parenting niche here on The Deliberate Mom. I’m looking forward to writing about whatever inspires me… whenever I’m inspired to do so! I certainly relate to the information overload and feeling rejection. I still can’t stand checking my Instagram numbers and seeing them go down! Same with Facebook, but to a lesser degree. I’ve been blogging for six years and I just consider it the long game. And like you, I am passionate about it. I see people do things so differently, but it’s like you said – we need to speak our truths. I’m sorry you’ve had rough blogging times, though! Dealing with feelings of “rejection” is going to take some time for me but I know I’ll feel a lot better once I let go of the need to please everyone. I’ve been blogging for six years too — we must have started around the same time. I couldn’t imagine not blogging but this new perspective will keep me a happier and healthier blogger. I don’t know what to say except “this is perfect”! ? I’m so glad you enjoyed this Stefani. It was an outpouring of everything that’s been on my heart and mind. Welcome back!? I did miss you but sometimes you need a break and you got a well needed one. I read every word you said and some of them resonated with. I used to think that my numbers were’t good, or maybe they were good but then I compared myself to others. Why was this person making or getting this when I couldn’t. I’ve stopped doing that and I now focus on myself and not anyone else. I stopped doing the millions of reviews/giveaways that put pressure on me and took time away from my family and I write what I want to write about. You’ve done a great job here and you’ll always have us who love you! The reviews and giveaways can definitely deplete creative juices! I’m so glad I have this new and refreshed perspective! Thank you for supporting me through this journey Amanda. You’re such a blessing to me. What a wake up call this is, Jennifer! I’m reading and paying close attention because I can relate on many levels. I’ve always loved your writing and I can’t wait to see what this next passionate phase of yours will bring. I’m excited for you as you follow your heart and God’s leading. I’m still listening (and reading), my friend! Thank you for much for encouraging words Marva. This is an exciting journey and I feel at peace to have come to these conclusions. I can’t wait to see what comes next too! “Just because someone wrote something that resonated with you, or emotionally affected you does not mean it has to be your truth.” Yes yes yes!! BE WHO YOU WANT TO BE. Great post and agree whole-heartedly. I know you are struggling with blogging, give yourself grace and time. It’s funny how it takes time for these revelations to come. I’m so excited about this and the changes it means for me AND my blog. Thank you for the encouragement my friend! Jennifer, I’m with ya. I feel like you are saying all the feelings swirling around in my head (I’m with ya with the Instagram thing! Crazy!). I love your guts to say it and go with it. I can’t wait to see your results! I’m so glad I shared this epiphany because it’s been confirmed by so many others that they felt the same way and just weren’t sure how to put it into words. I’m so excited to see where this journey takes me now! You’re sweet to think I’m big and “successful”. I’m starting to gauge that “success” differently now though. It’s not money – it’s connection – it’s ministry – it’s loving and supporting others. Thanks for the wonderful and encouraging words my friend! 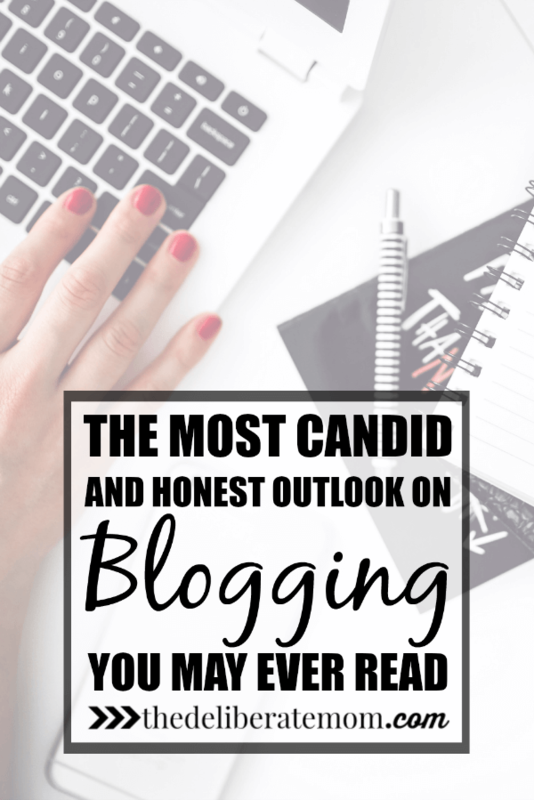 You came away from your blogging break with a great mindset. So many great truths here! I hope you are able keep this all on the forefront of your mind as you continue your blogging journey. I learned very quickly about not overwhelming myself with what I “should” do. Yes, I take some of the shoulds and add them to my to-do list. But I also choose to ignore many of the shoulds and blogging rules. Perfectly said! I especially like #2 – with all those “what bloggers MUST do” posts, one could go crazy! I tend to ignore those and just enjoy the process of writing and sharing ideas. Nope, I’ll never go viral, I’ll never have millions of pageviews, but I’ll have fun in the journey! Oh, Jennifer, I simply love this! Thanks for being so open and honest. I share so many of your views… I’ve said I write when I feel inspired to write… when God has laid it on my heart to write – not following a schedule preferred by others. Reading blogs and writing posts should never crowd out my commitments to my family and the time I spend in the only word that lasts forever – God’s word. So, while I look on at other’s success… I wait on the Lord to guide me and prayerfully what I write will be a blessing to others. Thanks for having the courage to share this. May God bless you on your journey. Thank you for this. I am working on blogging more seriously and have felt a lot of pressure to narrow my niche. I enjoy writing about what is getting me the most traffic (Michigan travel), but I really love everything else I write about (gardening/homemaking). I have been feeling a lot of pressure to pick one, and it has been causing me a lot of stress and anxiety. Thank you for essentially giving me the permission to do both unless I personally decide it isn’t working. I really appreciate your reminder to give ourselves grace and trust our own judgement; I will try not to forget it again. I’m so happy for you. I sense you took the time, courage, and energy it takes to evaluate your higher purpose and renew yourself. Love this post! Nancy A. What a refreshing take on blogging. My soul needed that! I’ve been getting lost in the “my blog just isn’t good enough compared to…” trap. Praying for your heart to be filled with peace and joy as you write all that God puts on your heart! Beautifully honest, Jennifer, and so encouraging to the rest of us on this journey right beside you. Thank you so much for sharing your hard earned wisdom with us! Jennifer, this is so thought-provoking, especially appropriate for me since I’m taking a 3 week blogging break while I move! I love your point about writing about what we’re passionate about. Also about not worrying too much about all the changes, improvements, webinars, courses. It can get endless! This was refreshing. This is excellent, Jennifer. I have been through much of what you have experienced in so many ways. It’s so terribly difficult to not feel overwhelmed, burdened even- with it all. And I especially have those insecurities and quite frankly, hopelessness for any growth or success with my own blog. Thank you for your honesty. I for one, think your voice and your words are incredibly important. Jennifer, this is amazing! You wrote how many bloggers feel, but are unable to write about it. Good for you! I have been frustrated with some of the same things. My main problem is that I’m passionate about too much! :) Over and over we hear about narrowing our niche, maybe it’s the “rebel” in me, but I don’t want to do that so I’m not. If it means less money so be it! I can’t wait to see what is shared in the future, I’m sure it will be great! Yes! I’m a professional writer, communications strategist and social media manager, but I write a parenting blog completely separately from my job. I’ve never been in it to make money – I just love to write. But I too was getting discouraged about all of those “how to get big!” articles because they just felt so fake and not like me. What I realized is that I’m going to do myself and my readers the most good if I figure out 1) what the mission of my blog is and 2) who would want to read a blog with that mission. That’s helped me focus my articles a bit without feeling like I’m putting myself in a box. It also helped me generate a lot of article ideas that I might not have had otherwise. OMG! Thank you for this! That is all I can say…..I will be coming back to this post over and over again throughout my blogging journey! I am so glad this resonated with you Melanie! I hope it encourages you — be yourself, write what you want, and forge the path that works best for you. I am Stephanie from Alabama. I am just about to give my blog a re-boot…trying to make it prettier and much more organized. I hope to do a “grand opening” in September. I find that I just have to break the rules. I tried to go niche, but I find it extremely hard to nail down just one single topic to blog about. It’s not in my random personality. I understand about overwhelming myself with the rules and “shoulds” and “should nots” of blogging. You’re right…it’s definitely a journey.